Don’t panic, but if you’ve got travel plans today or within the next couple of days, you might want to check the status of your flight. An unexpected incident that occurred earlier today may have just thrown off your itinerary in a major way: Thousands of flights across the country are now delayed due to a plane hitting a deer somewhere over Iowa. Sorry, travelers. Odds are, you’re staying put for now. Thankfully, no passenger injuries were reported onboard either, and aside from the windshield, damage to the plane was exclusively cosmetic. 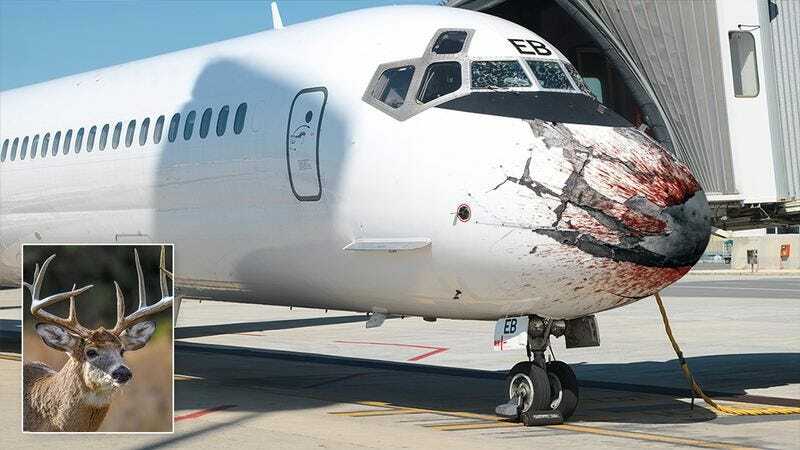 But as a result of the deer collision, the Federal Aviation Administration has grounded all flights out of major airline hubs until flying conditions are inspected and travel is deemed safe to resume. Shutdowns of this scale are a standard response from the FAA and have happened as recently as 2011, when a number of international flights had to be turned around after a Delta airliner hit a family of raccoons over the Atlantic about 200 miles off the coast. Although the delays have backed up countless flights and stranded thousands of people at airports around the country, the FAA clearly made the responsible move here. It’s better to fly out a little later than it is to fly out with a chance of your plane hitting a deer 40,000 feet in the air. Even so, it’s got to be hugely frustrating for everyone affected by this. All we can say now is hang in there, folks!